Good news, foodies! When it comes to recipe apps, you have a ton of good options. 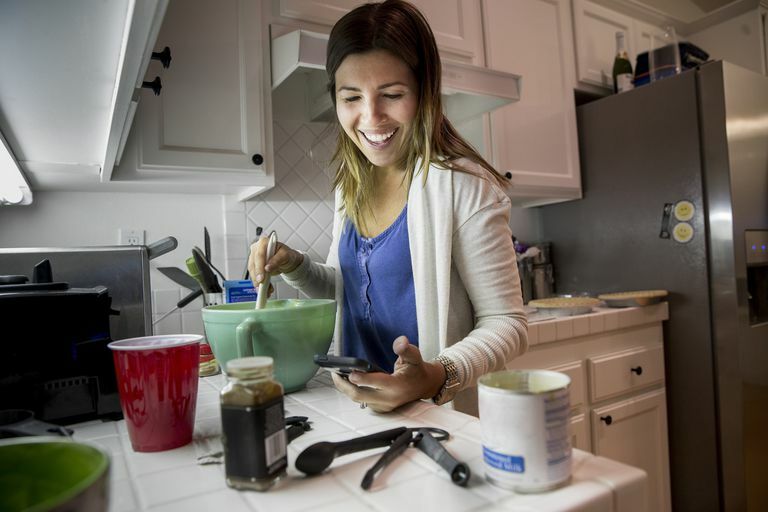 In fact, all the recipe apps we tested are noteworthy for one reason or another. The best have a few things in common, however: sleek interfaces that are easy to browse, gorgeous food photography, and good selections of recipes. We also looked for extra features like intuitive shopping lists, helpful cooking videos and nutrition facts. Whether you're looking for apps to help you with a diet, you're vegan or vegetarian, or you just want something to make dinner a little more interesting, here are our top picks. Can be buggy at times. May be difficult to navigate. From Jamie Oliver the creator of 15 Minute Meals and 30 Minute Meals, this is recipe app is high on the list of great apps. It includes detailed, step-by-step pictures for each recipe, so it's a perfect app for those who aren't confident in the kitchen. The recipes are easy to follow and there's a tab at the top that switches the ingredient amounts from two to four people. The downsides? The number of apps listed in the free version is much smaller than what you'll find in Jame's Ultimate Recipe App. That one's not free, but it does have more functionality. Adjust recipes for your grill. Difficult to transfer recipes to a new phone. Weber Grills is a great app choice for those who are serious about their meat. It includes more than 300 illustrated recipes and the pictures will definitely make you want to fire up the grill. Like many recipe apps, Weber Grills includes a shopping list and a favorites section. It also has lots of how-to articles if you're not yet comfortable or knowledgeable around a grill. The integrated grill timer is a nice touch, as is the doneness calculator, which tells you how long to cook different types of meat and at what temperature. The app also includes a built-in timer to work with Apple Watch. Learn to cook with unusual ingredients. Simplifies all types of cooking. New recipes don't update frequently. Some features require an upgrade. At first glance, the How to Cook Everything app may seem a bit pricey. But if you take a closer look, you'll realize that you get all 2,000 recipes from Mark Bittman's book of the same name — and the book is a lot more expensive. The app's interface is pretty sleek, although there are no pictures to accompany the recipes. It does include an integrated cooking timer and a shopping list. How to Cook Everything also has more cooking instruction than nearly any other recipe app, with videos on everything from how to sharpen knives to how to roast a chicken. It's a comprehensive resource that will turn you into a five star chef in no time. Includes a grocery list feature. Difficult to find specific recipes. If you have a problem coming up with dinner ideas, you'll want to take a look at the AllRecipes.com Dinner Spinner app. It's free and includes thousands of user-submitted recipes. Just shake your iPhone to find a new random recipe. AllRecipes is a good choice for vegetarians or those with special diets because you can filter the recipes easily. Nutrition facts are also included. The recipes take a few seconds to load over Wi-Fi — you have to look at an ad for a while the recipe loads — and there's no shopping list. If that feature is important to you, you can upgrade to AllRecipes Pro. App can crash at times. If you're still upset about the shuttering of Gourmet magazine, this free Epicurious app might make you feel better. Featuring recipes from Bon Appétit and Gourmet, Epicurious is definitely a foodie's app. The slick interface is easy to use and you can browse recipes by main ingredient, meal, or dietary consideration such as vegan or vegetarian. The recipes are displayed in a slideshow format. Although this is pretty, it does make for too much swiping if you're browsing a lot of recipes. I also encountered a glitch when some recipes weren't added to my shopping list. Even so, Epicurious is still a good deal among free recipe apps. Library is not frequently updated. Martha Stewart's recipe app includes a number of standout features for a low price. It supports push notifications, so each day you'll recipe a message for the daily recipe — a great feature if you want dinner ideas with a minimum of effort. The recipes are easy to follow and each one includes a picture. Martha Stewart's app also has a host of sharing options, including email, Twitter and Facebook. The shopping list is broken down by aisle, such as produce and meats, making it easier to manage in a busy grocery store. Easy to find new recipes. Grocery list and menu planner. App can feel clunky at times. If you like variety, the BigOven app may be a good choice. It's free but offers a whopping 350,000 user-submitted recipes so you'll never get bored. Most recipes include pictures, which is great, but there are only eight recipes listed per page. BigOven does have some excellent features, like a Leftover Wizard that searches ingredients you already have. The What's For Dinner? selection lets you see what other users are having for dinner that night. Twitter integration is another plus. While the functionality is impressive, BigOven isn't as sleek as other recipe apps and it can look amateurish in some areas. Easy to find categories of recipes. App can be buggy at times. This SparkRecipes app is a good choice for dieters. It includes nutritional information for all 500,000 user-submitted recipes. The app has a ton of search options even though it's free, which makes it easy to wade through the recipes efficiently. You can even limit recipes based on their calorie count. The instructional videos are helpful and load quickly over a Wi-Fi connection. Unfortunately, the recipes aren't as easy to follow because the ingredients and instructions are listed on separate pages. Browsing by category can also be overwhelming given the numerous recipes.